Thionyl chloride is an inorganic compound with the chemical formula SOCl2. It is a moderately volatile colourless liquid with an unpleasant acrid odour. Thionyl chloride is primarily used as a chlorinating reagent, with approximately 45,000 tonnes (50,000 short tons) per year being produced during the early 1990s. It is toxic, reacts with water, and is also listed under the Chemical Weapons Convention as it may be used for the production of chemical weapons. SOCl2 adopts a trigonal pyramidal molecular geometry with Cs molecular symmetry. This geometry is attributed to the effects of the lone pair on the central sulfur(IV) center. 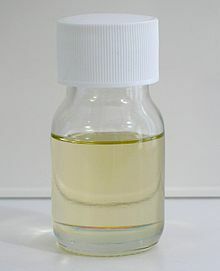 Thionyl chloride has a long shelf life, however "aged" samples develop a yellow hue, possibly due to the formation of disulfur dichloride. It slowly decomposes to S2Cl2, SO2 and Cl2 at just above the boiling point. Thionyl chloride is susceptible to photolysis, which primarily proceeds via a radical mechanism. Samples showing signs of ageing can be purified by distillation under reduced pressure, to give a colourless liquid. By a similar process it also reacts with alcohols to form alkyl chlorides. 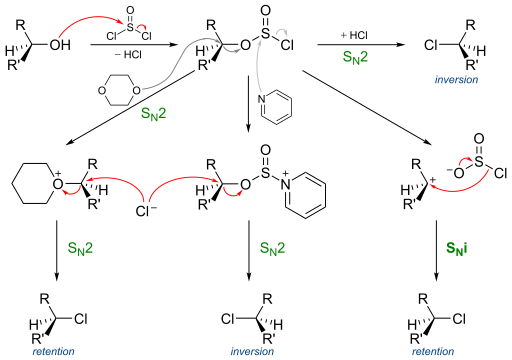 If the alcohol is chiral the reaction generally proceeds via an SNi mechanism with retention of stereochemistry; however, depending on the exact conditions employed, stereo-inversion can also be achieved. Historically the use of SOCl2 in combination with a tertiary amine such as pyridine was called the Darzens halogenation, but this name is rarely used by modern chemists. Conversion of a secondary alcohol to a chloroalkane by thionyl chloride. With primary amines, thionyl chloride gives sulfinylamine derivatives (RNSO), one example being N-sulfinylaniline. Thionyl chloride reacts with primary formamides to form isocyanides and with secondary formamides to give chloroiminium ions; as such a reaction with dimethylformamide will form the Vilsmeier reagent. By an analogous process primary amides will react with thionyl chloride to form imidoyl chlorides, with secondary amides also giving chloroiminium ions. These species are highly reactive and can be used to catalyse the conversion of carboxylic acids to acyl chlorides, they are also exploited in the Bischler–Napieralski reaction as a means of forming isoquinolines. Thionyl chloride can engage in a range of different electrophilic addition reactions. It adds to alkenes in the presence of AlCl3 to form an aluminium complex which can be hydrolysed to form a sulfinic acid. Both aryl sulfinyl chlorides and diaryl sulfoxides can be prepared from arenes through reaction with thionyl chloride in triflic acid or the presence of catalysts such as BiCl3, Bi(OTf)3, LiClO4 or NaClO4. These non-rechargeable batteries have many advantages over other forms of lithium battery such as a high energy density, a wide operational temperature range and long storage and operational lifespans. However, their high cost and safety concerns have limited their use. The contents of the batteries are highly toxic and require special disposal procedures; additionally, they may explode if shorted. SOCl2 is a reactive compound that can violently release dangerous gases upon contact with water and other reagents. It is also controlled under the Chemical Weapons Convention and listed as a Schedule 3 substance since it is used in the "di-di" method of producing G-series nerve agents. In 1849, the French chemists Jean-François Persoz and Bloch, and the German chemist Peter Kremers (1827-? ), independently first synthesized thionyl chloride by reacting phosphorus pentachloride with sulfur dioxide. However, their products were impure: both Persoz and Kremers claimed that thionyl chloride contained phosphorus, and Kremers recorded its boiling point as 100°C (instead of 74.6°C). In 1857, the German-Italian chemist Hugo Schiff subjected crude thionyl chloride to repeated fractional distillations and obtained a liquid which boiled at 82°C and which he called Thionylchlorid. In 1859, the German chemist Georg Ludwig Carius noted that thionyl chloride could be used to make acid anhydrides and acyl chlorides from carboxylic acids and to make alkyl chlorides from alcohols. ^ Patnaik, Pradyot (2003). Handbook of Inorganic Chemicals. New York, NY: McGraw-Hill. ISBN 0-07-049439-8. ^ a b c Lide, David R.; et al., eds. (1996). CRC Handbook of Chemistry and Physics (76th ed.). Boca Raton, FL: CRC Press. pp. 5–10. ISBN 0-8493-0476-8. ^ a b c NIOSH Pocket Guide to Chemical Hazards. "#0611". National Institute for Occupational Safety and Health (NIOSH). ^ a b c Greenwood, Norman N.; Earnshaw, Alan (1997). Chemistry of the Elements (2nd ed.). Butterworth-Heinemann. p. 694. ISBN 978-0-08-037941-8. ^ Mootz, D.; Merschenz-Quack, A. (15 May 1988). "Structures of thionyl halides: SOCl2 and SOBr2". Acta Crystallographica Section C. 44 (5): 926–927. doi:10.1107/S010827018800085X. ^ Brauer, Georg, ed. (1963). Handbook of Preparative Inorganic Chemistry. 1. Translated by Scripta Technica; Reed, F. (2nd ed.). New York, NY: Academic Press. p. 383. ISBN 978-0121266011. ^ Donovan, R. J.; Husain, D.; Jackson, P. T. (1969). "Spectroscopic and kinetic studies of the SO radical and the photolysis of thionyl chloride". Transactions of the Faraday Society. 65: 2930. doi:10.1039/TF9696502930. ^ Friedman, L.; Wetter, W. P. (1967). "Purification of thionyl chloride". Journal of the Chemical Society A: Inorganic, Physical, Theoretical: 36. doi:10.1039/J19670000036. ^ Van Woerden, H. F. (1963). "Organic Sulfites". Chemical Reviews. 63 (6): 557–571. doi:10.1021/cr60226a001. ^ Brenner, M.; Huber, W. (1953). "Herstellung von α-Aminosäureestern durch Alkoholyse der Methylester" [Manufacture of α-amino acid esters by alcoholysis of methyl esters]. Helvetica Chimica Acta (in German). 36 (5): 1109–1115. doi:10.1002/hlca.19530360522. ^ Clayden, Jonathan; Greeves, Nick; Warren, Stuart; Wothers, Peter (2001). Organic Chemistry (1st ed.). Oxford University Press. p. 295. ISBN 978-0-19-850346-0. ^ Arrieta, A.; Aizpurua, J. M.; Palomo, C. (1984). "N,N-Dimethylchlorosulfitemethaniminium chloride (SOCl2-DMF) a versatile dehydrating reagent". Tetrahedron Letters. 25 (31): 3365–3368. doi:10.1016/S0040-4039(01)81386-1. ^ Hogan, P. J.; Cox, B. G. (2009). "Aqueous Process Chemistry: The Preparation of Aryl Sulfonyl Chlorides". Organic Process Research & Development. 13 (5): 875–879. doi:10.1021/op9000862. ^ Pray, A. R.; Heitmiller, R. F.; Strycker, S.; Aftandilian, V. D.; Muniyappan, T.; Choudhury, D.; Tamres, M. (1990). "Anhydrous Metal Chlorides". Inorganic Syntheses. Inorganic Syntheses. 28: 321–323. doi:10.1002/9780470132593.ch80. ISBN 978-0-470-13259-3. ^ Peyronneau, M.; Roques, N.; Mazières, S.; Le Roux, C. (2003). "Catalytic Lewis Acid Activation of Thionyl Chloride: Application to the Synthesis of Aryl Sulfinyl Chlorides Catalyzed by Bismuth(III) Salts". Synlett (5): 0631–0634. doi:10.1055/s-2003-38358. ^ Bandgar, B. P.; Makone, S. S. (2004). "Lithium/Sodium Perchlorate Catalyzed Synthesis of Symmetrical Diaryl Sulfoxides". Synthetic Communications. 34 (4): 743–750. doi:10.1081/SCC-120027723. Persoz; Bloch (1849). "Des composés binaires formés par les métalloïdes, et, en particulier, de l'action du chloride phosphorique sur les acides sulfureux, sulfurique, phosphorique, chromique, etc" [Binary compounds formed by metalloids and in particular the action of phosphorus pentachloride on sulfurous acid, sulfuric acid, phosphoric acid, chromic acid, etc.]. Comptes rendus (in French). 28: 86–88. Persoz; Bloch (1849). "Addition à une Note précédente concernant les combinaisons du chloride phosphorique avec les acides phosphorique, sulfurique et sulfureux" [Addition to a preceding note concerning compounds of phosphorus pentachloride with phosphoric acid, sulfuric acid, and sulfurous acid]. Comptes rendus (in French). 28: 389. ^ Kremers, P. (1849). "Ueber schwefligsaures Phosphorchlorid" [On sulfurous phosphorus pentachloride]. Annalen der Chemie und Pharmacie (in German). 70: 297–300. ^ Schiff, Hugo (1857). "Ueber die Einwirkung des Phosphorsuperchlorids auf einige anorganische Säuren" [On the reaction of phosphorus pentachloride with some inorganic acids]. Annalen der Chemie und Pharmacie (in German). 102: 111–118. The boiling point of thionyl chloride which Schiff observed, appears on p. 112. The name Thionylchlorid is coined on p. 113. This page was last edited on 23 October 2018, at 12:59 (UTC).